Today my Innovalue gave me another salivating 9.4% return in an otherwise down market. 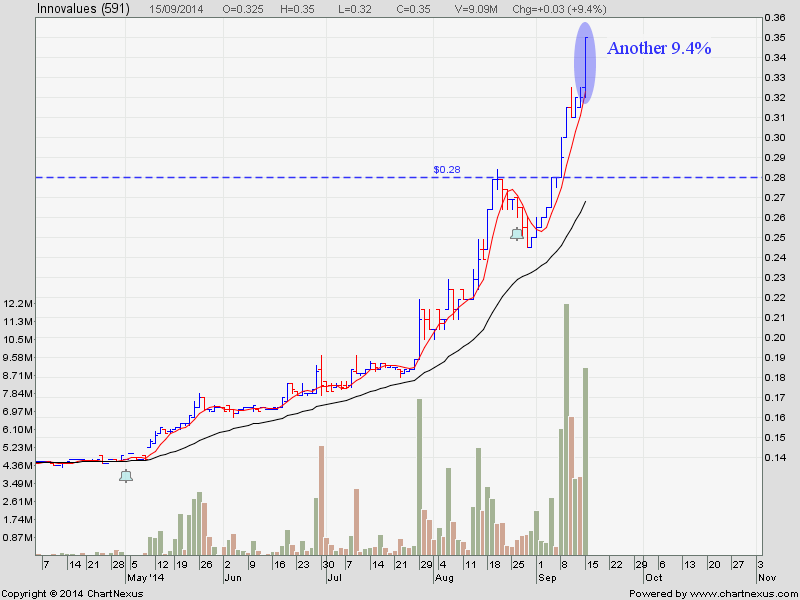 This stock may be my another Sky One for this month – Money drop from the sky ! Every month, 4 good trades like this will be more than enough to replace our monthly income regardless of the direction of the market. And this is humanly achievable through a good trading system. See how I caught this stock here. Due to the many email queries I received regarding using Unit Trust to ride the bull run in European Equity using Cash and CPFOA fund, I will be conducting another Unit Trust Seminar next Saturday to answer all these queries and more. During the seminar, I will demonstrate how I use my other wonderful Unit Trust Investing system to capture online any investment opportunity that arises from any part of the world and profit enormously from it. Seat are limited and on a first come first serve basis. Do register early for it here.